You can't help it: When you think "Teachers Village food crawl," your mind immediately goes to Maginhawa. While Maginhawa has rightfully earned its reputation as a gastronomic hub, the rest of Teachers Village is also teeming with treasures (a.k.a. lots of delicious food) waiting to be discovered. Case in point: Malingap Street, which sadly gets overshadowed by its more popular neighbor. It's a shame because Malingap is just as exciting, with its diverse range of often affordable choices. From Middle Eastern to all-day breakfast fare, you'll always find something new to dig into here. From the decor to the food, Little India is a piece of the South Asian country along Malingap Street. What's even more noteworthy is this restaurant offers a completely vegetarian menu—anyone who practices the diet knows how hard it is to find food spots that cater to them, excellent ones even more so. But Little India will please even the most adamant carnivore. Their Aloo Kofta Curry (P165) or deep-fried potato balls cooked in curry sauce bursts with so much vibrant flavor, you won't even think to look for meat. Little India is at 24-F Malingap Street, Teachers Village, Quezon City. Open daily from 11 a.m. to 10 p.m.
Malingap Street's Z Compound can safely say that they're one of first food parks in the local food scene, though on a smaller scale. Still, what it lacks in size it makes up for in the quality of the food you can find here. One of the more popular food stalls at Z Compound is Meshwe, which specializes in shawarma and other Middle Eastern staples. For only P65, the Chicken Shawarma, packed with grilled chicken, pickles, garlic sauce and fries, is a steal. You also wonât regret having the equally tasty Falafel (P70) this completely vegetarian meal has deep-fried balls made from chickpeas plus parsley, cabbage, tomatoes, pickles, fries, and tartar sauce stuffed in pita. Meshwe Authentic Lebanese Shawarma is at 33 Malingap Street, Teachers Village, Quezon City. Open daily from 4 p.m. to 10 p.m. If you're craving breakfast, pie, or both, look no further than Pi Breakfast and Pies. Chef Ed Bugia whips up your classic breakfast fare but with his own playful twists: Think Kitayama Wagyu from Bukidnon for his Wagyu Beef Sirloin Tapa (P255) or a Sriracha-laced hollandaise sauce for his Eggs Benny (P255). Of course, donât leave without having a slice of pie like the Momofuku Milk Bar-inspired Smack (P165/slice) or the Apple Gruyere (P155/slice), an intriguing sweet-salty take on the classic apple pie. Pi Breakfast and Pies is at 39 Malingap Street, Teachers Village, Quezon City. Open daily from 6 a.m. to 10 p.m. If you love Happy Tummy and their Thai food in Baguio, you should check out their Malingap restaurant, Happy Thai. They serve well-known Thai food at budget-friendly prices like the sour-spicy soup Tom Yum Goong (P195), and Pad Thai (P195). Plus, if you want Thai food but can't be bothered to leave the house, they deliver through Foodpanda. Happy Thai is at 22 Malingap Street, Teachers Village, Quezon City.ÂOpen daily from 11 a.m. to 10 p.m.
With their student-friendly prices and laid-back vibe, it's no wonder Tomato Kick is popular among UP students and alumni. Regulars swear by their Crispy Bacon Liempo (P170) or thinly sliced pork belly cooked to a crisp, but their pasta dishes are must-tries, too. Their Sisig Pasta (P180) probably pairs well with beer;with bottles starting at P50, it won't hurt your wallet to try. Tomato Kick is at 19 Malingap Street, Teachers Village, Quezon City. Open 12 p.m. to 2 a.m. (Monday to Saturday) and 5 p.m. to 2 a.m. (Sunday). If your idea of a great morning involves stacks of fluffy pancakes, youâll feel right at home at Ally's All Day Breakfast. Chocoholics and pancake enthusiasts (or both!) shouldn't miss their Death by Chocolate Overdose Pancake (P235/two pieces, P285/three pieces). With chewy chocolate pancakes, chocolate chips, chocolate-hazelnut spread, and chocolate ice cream, a bite will make you think you've died and landed in chocolate heaven. Ally's All Day Breakfast is at 22 Malingap Street, Teachers Village, Quezon City. Open daily from 7 a.m. to 10 p.m. Chef Ed Bugia reappears on this list with his other Malingap restaurant, Pino Resto Bar, where he focuses his creative energies on classic Filipino fare. Kare-kare and adobo get luxurious upgrades with the Kare-Kareng Bagnet (P255/single, P565/family) and Red Wine Adobong Tadyang (P245/single, P415/family), respectively. You can also get more casual grub like Longanisa-topped Nachos (P225) or Mini Sisig Tacos (P225). 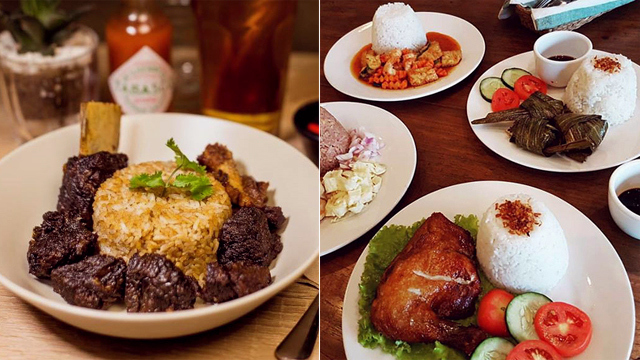 And if you're feeling adventurous, why not give the Nilasing na Adobong Kambing (P255), or beer-braised goat with rice pilaf, a try? Pino Resto Bar is at 39 Malingap Street, Teachers Village, Quezon City. Open from 11 a.m. to 12 a.m. (Monday to Saturday) and 11 a.m. to 10 p.m. (Sunday). With all-day breakfast fare, excellent third-wave coffee, and cool IG-worthy interiors, Catabolic Cafe has become a Malingap favorite. They're starting to become known for their fried chicken, too. The Chicken and Waffles (P330), with two golden waffles, strawberry butter, and golden-fried chicken, hits the spot with its perfect blend of sweet-savory flavors. Catabolic Cafe is at 22 Malingap Street, Teachers Village, Quezon City. Open from 11 a.m. to 11 p.m. (Monday to Friday) and 8 a.m. to 11 p.m. (Saturday to Sunday). Forget all thoughts of dieting when you enter Flying House. This casual diner focuses on food that'll leave you happy and content, which means lots of frying and gooey cheese. It doesn't get more indulgent than the Flying Pig (P200), or liempo that's wrapped in bacon then tossed in a special spicy sauce. Your arteries won't thank you but your tummy will. Pro-tip: A secret menu item that's a favorite among regulars is the FH Pancit, or instant pancit canton topped with corned beef, egg, a special secret sauce, and freshly baked pan de sal. This'll take you back to your college days. Flying House is at 10 Malingap Street, Teachers Village, Quezon City. Open from 11 a.m. to 1 a.m. (Tuesday to Sunday). At this point, who hasn't heard of Uncle Moe's Shawarma Hub? But before the many branches and food park stalls, they started out as a small place serving Persian food along Malingap Street. For a hefty meal, get a Kebab Platter with Buttered Rice (P182), which will get you two sticks of chicken kebab and two of beef kebab—though we have to admit we order the platter in large part because of the warm buttery rice, which you can make even richer with an additional slice of butter for P8. Another must-try is the Kofta Balls (P186) or cheesy balls of ground beef kebab in tomato sauce. If youâre a daredevil when it comes to food, donât leave without having the Ox Brain (P105). 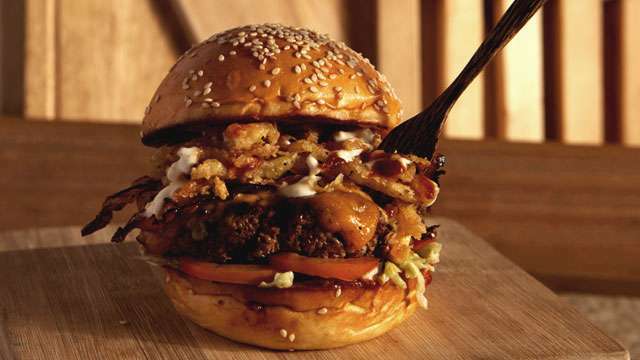 Fair warning: This gets dangerously close to heart attack-inducing, though you'll probably still want to wash it down with an ice-cold bottle of beer because, why not? Uncle Moe's Shawarma Hub is at 45 Malingap Street, Teachers Village, Quezon City. Open daily from 8 a.m. to 12 a.m.